Batman/Superman Vol. 4: Siege takes place in the shadow of the recent Superdoom event. While titles like Superman immediately moved on from the chaotic crossover, Siege sits with it a bit and offers the crossover a little context (before, of course, most of the Super- and Bat-titles move on to a new status quo post-Convergence). In this way, writer Greg Pak pens a Superman story that bridges, even, what's happening in Geoff Johns's Superman: Men of Tomorrow, and checks in one more time with the Super-universe before everything changes again. 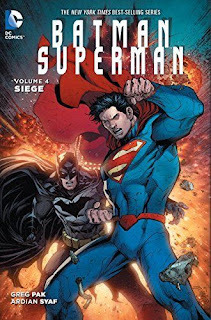 For the most part Siege offers a fine Superman/Batman team up with thankfully little of the incessant paralleling of the heroes that the title has tended to do. Where it ventures there, however, is in shoehorning in that the threat of the day is "Superman's Joker." Despite that the story mentions the concept constantly, if it hadn't I don't think anyone would have made the connection. The surprise villain really is not "Superman's Joker," a problematic concept to begin with, and the book's numerous attempts to convince the reader otherwise come off as distractingly melodramatic. Late in Siege, Clark Kent follows the steps where Doomsday killed thousands, and faces some of the economic effects of the Doomsday rampage. Superdoom had many problems, but given how quickly the Superman title left it behind in the switch from Scott Lobdell to Geoff Johns, there's something rewarding about Siege unexpectedly immersing itself in the post-Superdoom universe. The Super-family of sorts -- Superman, Supergirl, Steel, and Krypto -- are back together again in pseudo-pre-Flashpoint form, and other aspects of Superdoom are apparent: the ruined Fortress of Solitude, Lois Lane having been possessed by Brainiac. The bloated Superdoom seems less of a waste in its relevance and consequences. Though not every aspect of Siege works, it offers a nice tour through the current Superman status quo, if you like that kind of thing. Lex Luthor is here, reflecting Lex's current role as Superman's teammate in the Justice League; Hector Hammond makes an appearance, elevated to the level of major Super-foe after Scott Lobdell's Superman: Psi-War story. There's the new Lobo -- not for any good reason except to tie Superman into Lobo's momentary ubiquity in the DC Universe -- and the Atom Ray Palmer. Superman, Supergirl, and Batman end up in Kandor, because that's what a good Superman story does. And Pak even uses the super-flare power from Johns's Man of Tomorrow, such to demonstrate Superdoom and Tomorrow and Siege all happening in the same universe, to the same Superman. 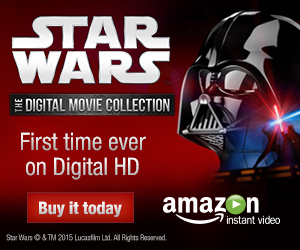 For shared universe fans, that's a whole lot of fun. Artist Ardian Syaf's presence through most of the book makes it feel like a graphic novel, with Syaf's Batman resembling Andy Kubert's at times. Batman's presence in the story is enjoyable, but incidental; he's there only because Superman asks for his help, not because the events really affect Batman any. That's fine -- in fact, that seems a more believable basis for a team-up -- but Pak layers on top of it Batman's wholly philosophical insistence that the mystery villain, the Phantom King Xa-Du, is "Superman's Joker." It's nonsense on many levels: that Xa-Du is in no way Superman's foil like a psychotic clown is for a benevolent bat; that Batman insists "a Joker" acts irrationally, whereas Xa-Du actually has some plan and motivation; and also that the rather silly Xa-Du pales in the end to the nightmarish Joker shooting Sara Essen, for instance. Superman's Joker is the Joker, ultimately, or Superman's Joker is Lex Luthor and Batman's Lex Luthor is also Lex Luthor, or something. It's highly unlikely that Xa-Du is an answer that's ever going to stick (at some point I thought the culprit might have been Toyman, which if we go back to the Winslow Schott version that killed Adam Grant, then maybe). There's a lot of bloody Joker imagery in the story, all Batman's imagining, and Batman talking about how the Joker killed Robin and crippled Batgirl -- tragic, but both subsequently undone. The story might've been more interesting if Superman had resolved in the end that Xa-Du wasn't his Joker and that Batman was simply obsessed, which for all the times Pak has Batman mention it almost seems the more likely scenario. Among other interesting aspects is that Pak introduces Superman's Kryptonian grandmother and aunt for the first time I can remember. In a small cheat, however, the story ends with the once-comatose Kandorians awake but conveniently de-powered and Superman's relatives among the only ones still in comas. Pak also seems to kill off Regan, a girl whom Superman kept from committing suicide in a well-regarded issue of All-Star Superman; it's a feint, in the end, but I'd wager an unwise one. To the extent that "Superman's Joker" is not all that frightening, I can see where Pak might have thought killing Regan would have emotional value more than just Xa-Du committing random destruction, but it's too charged given Regan's greater resonance. That she later turns up alive makes the whole endeavor seem too obviously manipulative. I had high hopes for the Futures End tie-in issue included here, in that it involves whatever falling out Batman and Superman had some five years in the future. Unfortunately, Pak has no more answers than the Futures End writers do, and so the story disappoints, with Batman just running around for a while and fighting Metallo. Though neither as earth-shaking as Geoff Johns and John Romita on Superman nor Gene Luen Yang and the game-changing "Truth" storyline in the same, Batman/Superman Vol. 4: Siege does a nice enough job marking time before Convergece, and ties together the disparate threads of the various Super-titles at the same time. I'm glad to see Pak's titles will be connected to the "Truth" and Batman: Superheavy when everything reconvenes next volume, though I do wonder where that leaves this volume's cliffhanger.